A spider web of epic proportions has been discovered deep in the Lone Star State -- and you won't believe how many spiders are in it. 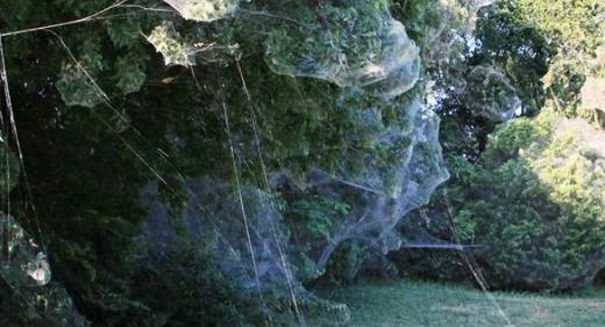 A spider web of biblical proportions has been reported in the Dallas suburb of Rowlett, with webs blanketing trees like giant shrouds, as one local entomologist described it as reported by Discovery News. The webs were found on CA Roan Drive and stretched up to 40 feet into the trees, with thousands of creepy-crawlies living inside them. It’s a rare occurrence, but not completely unheard of. Scientists aren’t surely which spider species built the web, but it was likely one from the Tetragnathidae family, according to the report. A giant web of similar size was found in 2007 in Lake Tawkoni State Park in Texas. Spider experts flocked to the region to glimpse the rare site, which was made possible by a large group of spiders that worked together to build the web. That’s not very common as spiders tend to be loners, but once in a blue moon it does with this species. It’s named Tetragnatha guatemalensis, and they have been known to build giant webs in cooperation with other spiders in the past. The spider is called the Guatemalan long-jawed orb weaver, and it is a slender and long-legged spider that can spin very big webs. As you can see by this latest event, they can sometimes be social and share webs with other species of spider and sometimes even insects, when they’re not devouring them. They’re typically the most populous resident of these webs, though, with maybe millions in the largest webs with many other species inside as well. It’s a pretty creepy sight to those who live there, especially since arachnophobia is the most common fear in the world. But don’t fear if you see it: these spiders are harmless, and insecticides aren’t necessary.